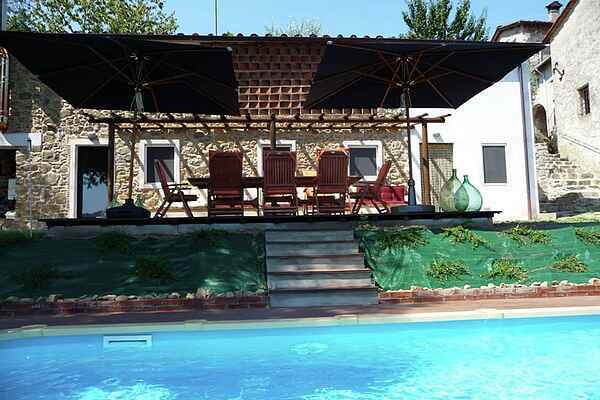 This beautiful holiday house has been built in several steps, the oldest part dates from approximately 1650. Then there are parts built on, so that a 150 m2 home has been created, which has been fully renovated. The house is fully equipped and comfortably furnished. The garden has a surface area of 400 m2, and provides beautiful views over the valley and the mountains in the distance. Around the swimming pool, there is a large deck with lounge chairs where you can enjoy the sun. The walnut tree provides the necessary shadow later in the afternoon. The house's location is optimal: up on a hill where there is a beautiful free view from the garden and all of the rooms. Lower on the hill there are centuries old olive trees. The house is in a part of the village where there are about 20 houses. This house is the most recent village house and is detached. It is located a bit off of the road, cars can't be heard. You can park in one of the car parks at the entrance to the village, and from there it is about 75 metres walk to the house. This house is not suitable for people who have trouble walking! Easy to reach : Lucca (25 minutes in the car), Pisa (50 minutes), Florence (75 minutes), Siena (100 minutes). The Cinque Terre area is located about 1 hour away. This beautiful holiday-home can make your holiday the pefect holiday in more then one way. The house is located in a quiet spot, at the end of the authentic village. On the other hand the house is located at the perfect spot for visiting famous cities, villages, musea, beaches and nature-reserves. We notice that most guests choose the best of both worlds. A few days of enjoying the peacefull location, the magnificent views and the pool and a few days of exploring the suroundings. The house itself is renovated in a way to make you feel at home right away. This was done on purpose of course, a place where you can relax and make home away from home!